Working closely with our partners at ICA Group, Accessa Coatings Solutions can help clients explore how Glass Coatings can improve their products. ICA’s water-based Glass Coatings are offered in a specific range for the painting of glass, both flat and hollow. 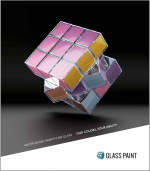 ICA Group’s glass range is composed of transparent, colored, lacquered and metallic monocomponent and bicomponent water-based paints that make it possible to achieve high-quality, beautiful results. Expect to experience an unrivaled array of effects and colors, and excellent adhesion and chemical/physical resistance. The products are nonflammable, making them easy to store, and dilutable in water, so they are simple to prepare and use. Moreover, due to their low levels of volatile organic compounds, they allow for compliance with the regulations on the limitations of solvent emissions into the atmosphere. ICA Group’s range of high-quality coatings, which over the years has been geared more and more toward reduction in environmental impact, has enabled the company to be recognized as one of the most technologically advanced players in the market, both in Italy and internationally. Count on Accessa Coatings Solutions to help you solve your glass-coating problem or take advantage of this newer coating type. Explore the performance tests these products have passed below. Get the full brochure to browse product highlights, see samples and more.